On April 10, 2013, President Obama released his Fiscal Year 2014 budget request. 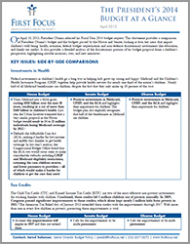 This fact sheet looks at how children fare in his discretionary budget proposal, highlighting notable increases, cuts, and new initiatives. It also compares the president’s proposal on key children’s issues to the budget resolutions passed by the House and Senate. First Focus will release fact sheets providing more detailed analyses of the President’s budget proposal for key children’s issues, as the Administration releases policy details.